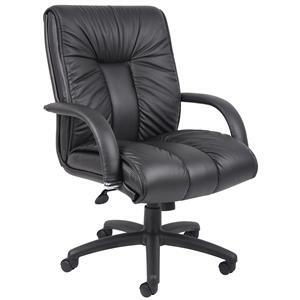 Give your office the incredible comfort of this high back executive chair. 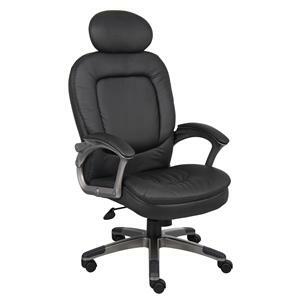 Padded armrests and Caressoft upholstery allow you sit back and relax, while pneumatic seat height adjustment, tilt tension control, an upright locking position, and extra lumber support let you work without being uncomfortable. 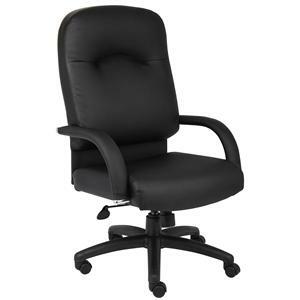 Bring this excellent executive chair to your home or office today. 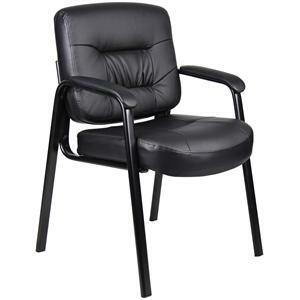 Enjoy the contemporary style and ergonomic features of this black top grain leather executive chair for your home office. Upholstered in top grain leather, the chair features a waterfall seat design eliminates leg fatigue as well as an ergonomic back design with lumbar support. Additional features include NTR- No tools required for assembly, upright locking position, adjustable tilt tension, pneumatic gas lift seat height adjustment, and optional knee-tilt mechanism available with model B8702. Weight Capacity: 250lbs. You'll be set with this guest chair in your home office. The piece carries a black finish as well as upholstered seat and back cushion, which provides a comfortable padding. Simple and sleek, this upholstered chair is bound to please. 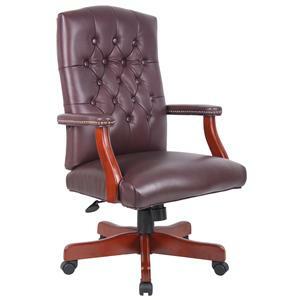 Old World Italian styling makes this executive chair available in two colors a refined choice for your home office. The classic traditional button tufted styling and elegant traditional Cherry finish on all wood components along with hand applied brass nail trim offers the traditional look. Choose from Burgundy (BY) or Black (BK) Italian Leather. Weight Capacity: 250lbs Matching guest chair model (B969). 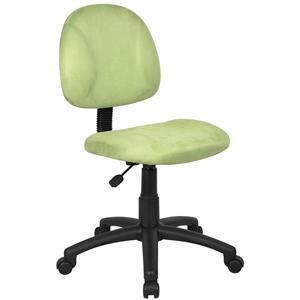 Dimensions: Arm Height:27-30.5"H. Seat Size: 20.5"D x 21.5"W. Seat Height: 20-23"H.
Create a fun and inviting home office or homework station with this casual lime green task chair. 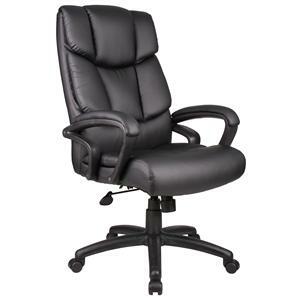 Enjoy the comfort of the thick padded seat and back with built-in lumbar support. The waterfall seat will keep you comfortable while you work by reducing stress to your legs. Customize the perfect fit with the adjustable back depth and pneumatic seat height adjustment. A five star nylon base provides easy mobility and extra stability, and includes hooded double wheel casters. Available in microfiber colors. 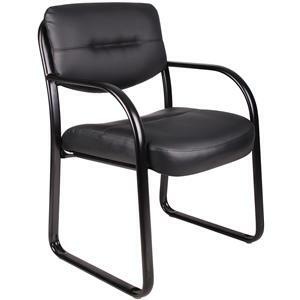 Bring a touch of comfort into your home office with this guest chair. The piece carries a black finish as well as upholstered seat and back, which provides comfortable padding. In addition, attached armrests are also included. Make your office complete with help from this guest chair. Furnish your office space with this multi-function drafting stool. It is upholstered in a black LeatherPlus fabric for a sleek contemporary look. The back angle lock allows the back to lock throughout the angle range for perfect back support and the seat tilt lock allows the seat to lock through the tilt range. 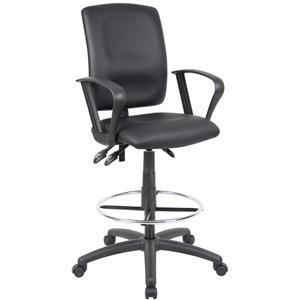 The chair has a pneumatic gas lift for seat height adjustment, a large 27” nylon base for greater stability, a strong 20 inch diameter chrome footring, and hooded double wheel casters. 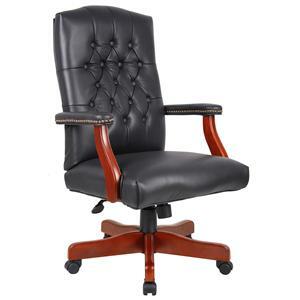 A sleek, modern design gives this high back executive chair an elegant style that looks amazing in any office. However, its greatest feature is undoubtedly the comfort that this chair provides. With padded arm rests, a padded head rest, and a plush seat and back you can easily remain comfortable throughout the workday. If that isn't enough, it also features pneumatic seat height adjustment, tilt-tension control, and hooded double wheel casters.